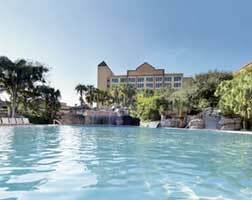 The Radisson Resort Orlando Celebration offers a number of ways to make your stay extra special if you know about them! -Block 6000 is recommended by some for a pool view, and convenience for catching the shuttle to the Disney theme parks. -If you have kids and are using the car a lot, get a room closer to the parking area, like Block 5000. -‘Sleep Number’ rooms with their special, remote-controlled hardness settings, are worth a little more. -For views of the nightly firework displays, try a higher floor, in the back.